If you have been following my blog over the past few years, you've probably noticed that I started a publishing company called Charles Lane Press. A lot of people ask me why it's called that, and the reason is simple: Charles Lane is the unique little New York City alley that I have lived on for the past 13 years. This alley, in the Far West Village of Manhattan, was photographed in 1938 by Berenice Abbot, and though the buildings on the Lane have all been spruced up and tricked out in the past decades, the paving stones are still there and are some of the oldest paving stones in Manhattan. 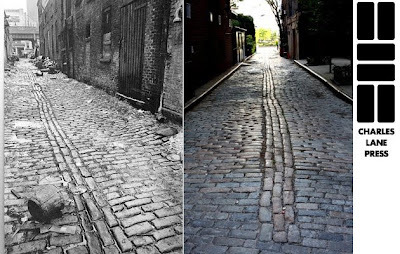 The stones of Charles Lane were first laid after the Revolutionary War and is one of the only streets in lower Manhattan that was never paved over. If you are an urban archaeologist, you probably know that most of the paving stones in lower Manhattan are of the Belgian Block variety, laid in the 1800s. Well, Charles Lane's are long, thin rectangles from the 1700s! So if you're ever in the Far West Village, check out our charming little street.